Remember that really great Transformers: War for Cybertron game we reviewed last week? This isn't it. This is Transformers: Cybertron Adventures, and it is not the Wii version of War for Cybertron. While the story may cover similar ground and contain many of the same characters, Next Level Games' Cybertron Adventures trades the third-person shooting of its Xbox 360, PlayStation 3, and PC counterpart for a combination of driving, flying, and on-rails shooting. It's a completely different game, hence the completely different name. Transformers: Cybertron Adventures is definitely a more kid-friendly Transformers game than War for Cybertron, but a game can be kid-friendly and still be good, right? Perhaps not in this case. It's Transformers: It may be nothing more than a shooting gallery where the targets shoot back and a rudimentary driving game, but hey, you're still playing as Bumblebee, Optimus Prime, and Megatron, right? For all the game's failings, it still manages to put you into the giant metal boots of some iconic characters, even if they are severely crippled. Hearing Bumblebee talk to himself as he sneaks inside a heavily fortified Decepticon base brings me right back to the original cartoon series. The Shooting Is Nice: The majority of my time in Cybertron Adventures was spent hiding behind columns, popping out to take pot shots at an army of faceless Autobot and Decepticon drones using one of four different weapons - blaster, sniper rifle, missile launcher, and minigun. Like Time Crisis, it's a shooting gallery with a rudimentary cover system built-in. You've got unlimited ammo, the controls are rather responsive, and in most cases there's no time limit. You don't even have to move yourself; the game does all the work. It's almost relaxing in its simplicity. Cybertron Sure Is Bland: You'd think a giant metal planet filled with colorful metal combatants with glowing purple and red accents would be a bit snazzier, but the Cybertron of Cybertron Adventures is a particularly bland place to wage a war. The textures are simple and the scenery plain. I almost got the feeling that the developers were going for an animated cartoon look and feel, yet it comes across more primitive than artistic, especially when populated with modestly detailed renditions of re-envisioned Transformers High Moon Studios created for War for Cybertron. Missing Story Hooks: The missions in War for Cybertron, divided equally between Autobot and Decepticon, jump disjointedly from one point to the next, with no connective tissue in-between. If you played War for Cybertron beforehand as I did, it almost seems like this game is fleshing out the story from that one. The problem is that would assume everyone was playing both games, and that's not very likely, especially after this review is finished. Driving Woes: When you aren't busy shooting Deceptiducks in a robo-barrel, Cybertron Adventures has you taking to the open road or open skies in a series of driving segments that are as frustrating as they are brief. Technically you're still on rails, but now you can at least steer and accelerate (there's no stopping). While driving, you'll be firing machine guns at obstacles, locking on to enemy fighters with missiles, or attempting to make jumps. I say attempting, because at least once per jump in the game I found myself watching my car sail gracefully towards the other side only to hit the edge of the landing area at an angle and fall to my doom. One minute the car looks like it's making the jump just fine, the next minute I'm restarting from my last checkpoint. It's very sloppy. A Three-Hour Tour: Don't expect your Cybertron Adventures to drag on. A full play through of the game from the beginning of the Autobot campaign to the tail-end of the Decepticon story took me between three to three and a half hours. Finishing a chapter opens it up in the game's 's challenge mode, but that's just a fancy way of getting players to replay the same content. I suppose I should be thankful it was so brief. You Cannot Transform: Come on, folks, this should be pretty basic. People play a Transformers game because they want to be transforming robots. It's the core concept the entire franchise is based on. Scripted shifting from car mode to robot mode does not a Transformer make. If I can't hit a button to change from a towering mechanical man or woman into some method of conveyance, you have failed to make a Transformers game. Released alongside a far superior product for the PlayStation 3 and Xbox 360, Transformers: Cybertron Adventures doesn't even come close to matching War for Cybertron in quality or content. I understand that some publishers see the Nintendo Wii as a family-friendly console, and I'm aware of the difficulty involved with trying to sell a more mature experience on a console geared towards that demographic. That's no excuse for not trying. Where Transformers: War for Cybertron stands as a shining example of how a licensed property can be fashioned into an excellent video game experience, Transformers: Cybertron Adventures serves as a grim reminder of how bad a licensed game can be. 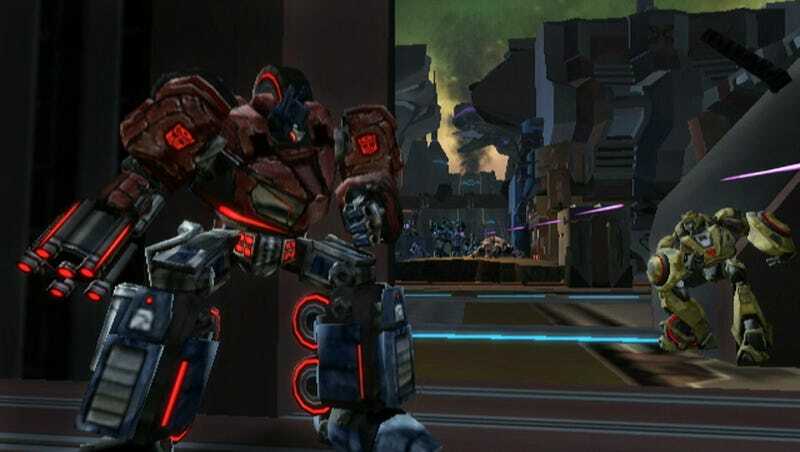 Transformers: Cybertron Adventures was developed by Next Level Games and published by Activision for the Nintendo Wii on June 22. Retails for $49.99 USD. A copy of the game was given to us by the publisher for reviewing purposes. Played through entire game at standard difficulty.